In this video, Dr. Huntoon discusses Auto-Immune conditions and what you need to understand if you ever will get well. Your medical doctor will not have a true solution to your Auto-Immune concern and will recommend medications that contribute to your condition. When you are ready for a different tactic, one that works, please give the office a call. Joint stiffness is a hallmark of rheumatoid arthritis (RA), a chronic disease that affects 1.3 million adult Americans. 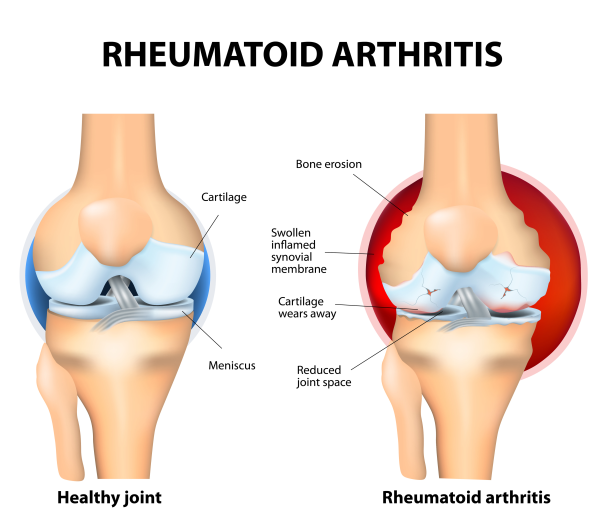 Resulting from an abnormal response of the Immune System, Rheumatoid Arthritis inflames the soft tissue that lines the surface of joints (called the synovium). It is a systemic disease that not only makes joints stiff and painful, but can also affect other parts of your body, such as internal organs. By noting symptoms such as joint stiffness and seeking early treatment, you can feel better, slow or stop progression of the disease, and minimize joint damage. This allows you to live a more active, full life. Please read Dr. Huntoon's Alternative Medical Treatment Options below for your natural solutions before going on medication. How well you can move an arm, leg, or finger in different directions reflects the joint's range of motion. If you develop joint stiffness, your range of motion is reduced. Your joint doesn't move as well as it once did. Joint stiffness may occur with or without joint pain. Other signs and symptoms in addition to the joint stiffness will help your doctor figure out what kind of arthritis you have. With rheumatoid arthritis, joint stiffness and other symptoms such as pain or fatigue tend to develop and worsen over several weeks or months. Joint stiffness is most noticeable in the morning and may not improve for an hour or two. Sometimes it lasts throughout the day. Shoulders, hips, and jaw may also be affected. At least two or three different joints are involved on both sides of the body. Three different processes occur as RA progresses. In the first, the lining of the joint becomes inflamed. This causes stiffness, pain, warmth, redness, and swelling around the joint. Severe morning stiffness, which can limit your ability to function, is often the very first sign of the disease. In the second, the rapid division and growth of cells causes the synovium to thicken. In the third, the inflamed cells release enzymes that may digest bone and cartilage. The more risk factors you have, the more important it is to get early treatment. Symptoms such as joint stiffness and pain can tell your doctor a lot about your type and extent of arthritis. That's why it's so important for you to keep track of your symptoms. Keeping a symptom chart for a few weeks can help confirm a diagnosis of rheumatoid arthritis. Before you see your doctor, make a list of your symptoms and describe when they occur. Do they occur after a particular activity or first thing in the morning? Medical treatment will include medications and several types of therapy. spas, for example, can help relieve joint stiffness and pain. Hydrotherapy involves exercising and relaxing in warm water. Cold works best for acutely inflamed joints. Relaxation techniques help release muscle tension, relieving stiffness and pain. An occupational or physical therapist can teach you how to use your body so you can reduce stress on your joints, for example, by using the strongest joint available to do a job. This is called good body mechanics. weight control reduces stress on joints. Exercise can also strengthen muscles and joints. Water aerobics is a good choice. It improves your range of motion without putting extra stress on joints. To protect your joints, alternate between periods of rest and activity. But at least once a day, gently move your joints through their range of motion. If needed, use of assistive devices to reduce joint stress and relieve pain. This can include a cane, walker or a wheel chair. Pay attention to early signs and symptoms of rheumatoid arthritis, such as joint stiffness. Early, frequent Chiropractic treatments can greatly limit joint damage. Your doctor will help you develop a treatment plan for best results. Dr. Huntoon has quite an extensive experience in helping people deal with this auto-immune system problem. By addressing the reason for the auto-immune system problem, Dr. Huntoon has helped people eliminate this condition altogether. Then Dr. Huntoon will help you rebuild your joints and your health so you do not succumb to this difficult health condition. Working with a Holistic Chiropractor who can help you develop a well-rounded, multi-faceted approach to treating your stiffness is important. This may include joint manipulation / mobilization and whole food supplements. Understanding the time commitment and the expectations is prudent. See a doctor to assess joint stiffness, pain, or swelling that lasts more than two weeks. Your doctor may refer you to a rheumatologist, a doctor trained in the diagnosis and treatment of arthritis and other diseases of joints, muscles, and bones. Bring information about your joint symptoms and note whether you have any that are unrelated to your joints, such as fatigue or weight loss. Pain is often a partner to joint stiffness. Do your best to describe it. You may think of joint stiffness as a type of vague muscle ache. That's partly because symptoms may be subtle at first. Your doctor will confirm the presence of joint stiffness as discomfort you experience when trying to move. The doctor will assess your joint's mobility. You may be asked to move the joint to check its active range of motion. If the doctor moves the joint to examine its mobility, this is called passive range of motion. Your doctor will also check your joint for swelling, enlargement, and tenderness. A variety of tests can help your doctor evaluate your joints and check for signs of systemic disease.